Day 2 has been measured out with equal parts adventure and frustration. We accidentally bought premium gas. Joey almost broke the car by overusing/abusing the cruise control. He pulled over while I was napping and I kind of freaked out. Then in Wyoming we encounted some serious rain, soaking the front corners of the futon strapped on top of the car. On our way to the campsite we had some trouble with directions. And then when we got to the site, they had trouble with the credit card machine, only to realize they'd already charged us. At the end of the day we visited Mt. 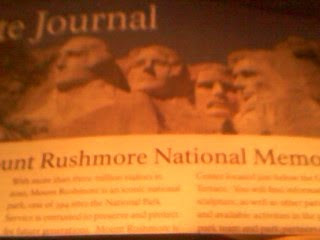 Rushmore, and not only had the "year pass" increased by a dollar, they only took cash. It all worked out, but it was weird and complicated. Joey is currently setting up the tent. Tomorrow is going to be about a 16 hour drive, so it's sleepy time. Finally.